Lesiba: Lesiba Bapela is a social justice activist from Polokwane in the South African province of Limpopo. 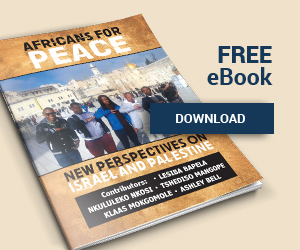 Having been exposed to anti-Zionist activism on campus while advocating for the rights of students, Bapela decided to visit Israel to see the situation for himself. He spoke to Zenobia Ravji in July 2016. Zenobia Ravji: Prior to going to Israel, were you involved in the BDS movement? Lesiba Bapela: As much of an activist as I was, BDS was not some- thing I was part of. I was not drawn to it because I didn’t understand what it meant to be part of BDS. I work on issues and with groups that, in our political circumstances, are strongly attracted to the BDS campaign, but personally, I just didn’t have interest in it. What type of activism were you involved in on your campus? My work as a social justice activist revolved around student rights and creating a more inclusive campus environment. That brought me into contact with the BDS activists who have emerged from the anti- Israel sentiment in South African politics. So what sparked your curiosity about Israel? I constantly heard the term “BDS,” especially at campus protests during Israel Apartheid Week. So I felt I needed to explore both sides of the story. I wanted to actually see what is happening, rather than being told what is happening, in Israel, in the West Bank, and in the Middle East. How did you get to Israel? Israel Forum. I was part of the group that went in January 2016 to Israel. Who were the other participants in your group? The group was mostly made up of student leaders and activists. Some were Christian, and some were not religiously affiliated but more African traditional. Where did you guys go in the region? We went to the West Bank, where we visited Ramallah and Palestinian refugee camps like Kalandia. And in Israel, we went to Jerusalem, Tel Aviv, and Haifa, where we visited the Israel Institute of Technology, the famous Technion. What was your opinion of Israel before your trip? I need to be honest with you. I did not know anything! All I knew was that there is a consistent fight between Israelis and Palestinians. So to go beyond mere curiosity, I needed to get my facts right and understand what the actual issues are. When you arrived in the region, what did you see that really surprised you? In South Africa, I had frequently heard the description of Israel as an “apartheid state.” As a black man coming from South Africa, where we actually experienced apartheid, I realized that this was not apartheid. This was not the same situation. The conflict between the Palestinians and the Israelis seems to me to be religious in nature. There is a lack of tolerance between both communities. And the Palestinians are wrongly attributing their situation to “apartheid,” in order to express their frustrations. Did other members of your group view the situation as you did, or did they have different opinions? We all came to the same conclusion, based on the facts and our experiences. For instance, we saw that in the West Bank, the Palestinians were more hardline. They don’t believe in a two-state coexistence. They want to govern themselves according to Islamic law, and they don’t believe in Israelis having their own territories. However, on the Israeli side, I heard talk of cooperation. The Israelis have been inviting the Palestinians to create peaceful coexistence. But the Palestinian Authority has this all-or-nothing mentality and doesn’t truly believe in a two-state solution. Did any of what you saw in Israel remind you of the bantustans, the “homelands,” which the apartheid regime created for black people in South Africa? That’s also a comparison that often gets made. No. We need to differentiate between what apartheid was in South Africa and what the conflict between Israelis and Palestinians involves. There is nothing in this conflict that I can associate with apartheid. This is a religious conflict. What were your experiences going through the Israeli checkpoints? Did the Israeli soldiers view a group of black visitors from South Africa with suspicion? They were not that restrictive. I don’t know the criteria to check IDs, but we were never requested to produce our passports. Based on your personal experiences, you don’t believe that Israel is an apartheid state. So why do you think Palestinian leaders and political factions compare their situation with black South Africans living under apartheid? I think it’s part of seeking sympathy and solidarity from the international community. If you can tell a black South African about racism and apartheid, you are too quick to evoke their emotions and their sense of sympathy toward anything related to racism and apartheid. The Palestinians think that this sympathy or solidarity from South Africans will help them win international solidarity more widely. And do you think that strategy is working? It’s working for people who are misinformed, because it’s so easy to convince someone who hasn’t seen and experienced the situation for themselves. How does it make you feel that the BDS movement compares the situation of the Palestinian people with the plight of black people under apartheid? It upsets me a lot! A lot! Because it’s misleading! The situation cannot be compared to apartheid because it’s not apartheid. Those people involved with the BDS movement need to go to Israel and the West Bank to see the situation for themselves. They need to see and experience the truth, not merely act on what they have been told. I mean, it’s easy for you to tell me and convince me of what is happening in New York. But it takes me coming to New York and exploring the city to properly understand what is happening at the moment. Let the BDSers go and see Israel and Palestine for themselves, rather than making these misinformed generalizations. When I travelled to Israel for the first time in 2014, I had the same experience as you. I came to see the situation as you did. So I’m glad to know that my experience was not unique. It’s an eye-opening experience for us social justice activists especially, because our activism on other issues often involves supporters of the BDS and anti-Israel movements. It’s easy to blindly support movements that your peers also support. However, just because your peers support something, doesn’t mean it’s true. This is a very complicated situation. It’s one that we need to see and experience for ourselves in order to fully grasp the truth and the reality. When you returned to South Africa, did you tell people about your experiences? How did they react to you? How did your pro-BDS colleagues react to you? After my return to South Africa, I wrote a piece for our national newspaper, The Sowetan, in which I talked about the worrying views we heard from many Palestinians. I also paid tribute to the Palestinian Christians I met, all of whom rejected violence. My analysis got good feedback from my friends and colleagues. They came to understand that there is a difference between someone who has seen the conflict, rather than just heard about it. Many people were convinced by my arguments and were curious to know more about the dynamics of Israel and Palestine. Some are now eager to make the trip themselves. What are your hopes for the future of Israel and Palestine? Coexistence and democracy. There is nothing that inspired me more than Israel’s universities, especially the Technion in Haifa. It’s about diversity there. It’s about Arabs and Jews working together. It gave me a sense of hope because there was a spirit of tolerance. That’s where you could see coexistence. For the Palestinians, I would like to see a democratic Palestine, with freedoms and rights for the people, like we now have here in South Africa and in many other countries. Of course, things are not going to change overnight. It’s going to be a process.